Carpenter ants are important in the balance of nature because they burrow and nest in dead trees and enhance decay of the wood. They achieve pest status when a colony invades and damages the integrity of the wood within a house. Carpenter ants are generally jet black, but there may be some that are reddish in color. They are among the largest of ants; their size range from one-eighth to one-half inch in length. This variation in size depends on the species. Also, colony members include “major” and “minor” workers as well as the “queen”, the reproductive member that produces all additional members of the colony. The “castes” are different in size and appearance. Mature colonies produce winged reproductive ants at any time, but the majority develop in late summer. Surviving pairs attempt to establish new colonies. The diet of carpenter ants is quite varied and includes living and dead insects, honey-dew from aphids, sweets, meat, and fats. They do not eat wood. Foraging workers collect all the food for the colony. They carry food back to the nest intact or ingested and later regurgitate it to non-foraging members in the nest. These ants may forage up to 100 yards from the nest to search for food. Carpenter ants may become pests in houses by foraging there for food. The greatest concern, however is that they may cause serious damage to wood in the structure. Unlike termites, they do not feed upon wood, but merely use it as a place to nest. Carpenter ants construct their nests in hollow trees, logs, posts, landscaping timbers, and wood used in homes and other structures. These ants prefer to infest wood that is moist and rotting. They will also use an old abandoned nest or wood that has been “gallerized” by termites. Nest may be located in hollow doors or small void areas produced during construction. Carpenter ants may move from decaying portions of wood into sound lumber in the process of expanding the nest. They cut galleries with the grain of the wood following the softer parts of the wood. The ants leave harder parts of the wood as walls separating the tunnels and cut openings in these walls to allow access between tunnels. Access to the outside may be through natural openings, or the ants may cut openings where none exist. Carpenter ants keep occupied galleries clean. They remove wood in the form of a coarse sawdust-like material, which they push from the nest. This often results in a pile of frass (sawdust) accumulating just below the nest entrance hole. This pile may include, in addition to wood fragments, other debris from the nest, including bits of soil, dead ants, parts of insects and remnants of other foods they ate. Professional Pest control services are recommended for the elimination of carpenter ants within a structure. One treatment usually does not eliminate the infestation, because the nest may be difficult to locate. Also since, in some cases, only foraging workers will be affected, repeat applications are necessary to continue to kill these exposed ants until the entire colony dies from lack of food from the foragers. It may be a slow process to destroy an ant nest, so be very patient. 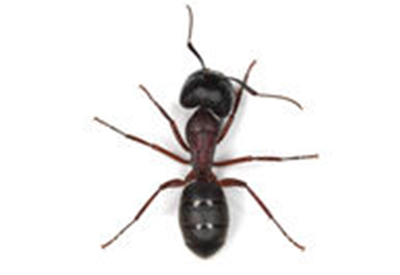 Arrest-A-Pest has extensive experience treating carpenter ants. Over our 30+ year history, we have treated thousands of homes and other structures successfully for this invasive and destructive pest. So, for information and cost, contact Arrest-A-Pest at info@arrestapest.com or call us at 1-800-338-PEST.